IPv6 Related Stuff: Netflix and "This webpage has a redirect loop"
Netflix and "This webpage has a redirect loop"
Suddenly Netflix was not working anymore: my Chrome on Ubuntu Linux said "This webpage has a redirect loop" on www.netflix.com. Netflix advised to clear my cookies. The real cause was different: IPv6, and possibly my Hurricane Electric IPv6 tunnel. After disabling IPv6 in Chrome with the startup command "google-chrome --disable-ipv6", Netflix was working again. 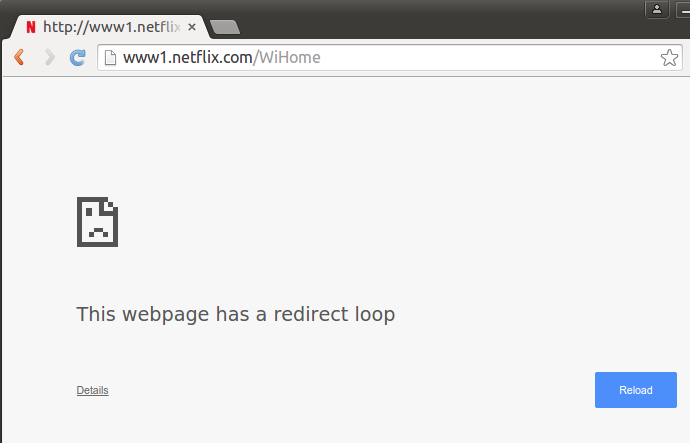 ... and now a plain google-chrome startup (so with IPv6 enabled) leads to a working Netflix! @NetflixNL IPV6 on the http://netflix.com site is broken (connection timeout on the first HTTPS request) coming from a SiXXS tunnel. I don't see any AAAA records in the netflix.com DNS zone. www.netflix.com is an alias for www.eu-west-1.netflix.com. www.eu-west-1.netflix.com is an alias for www.eu-west-1.prodaa.netflix.com. www1.netflix.com is an alias for dualstack.wwwservice--frontend-san-756424683.us-east-1.elb.amazonaws.com.